(NaturalNews) Social media has admittedly done a number on the collective IQ of humanity. But nobody ever could have anticipated the level of heartless narcissism that took place recently on a popular beach in Argentina, where hordes of smartphone-gripping zombies reportedly swarmed two rare dolphins in order to capture "selfie" photos with the helpless creatures, one of which suffered a gruesome death after it was ripped from the water and left on the sand to suffocate. 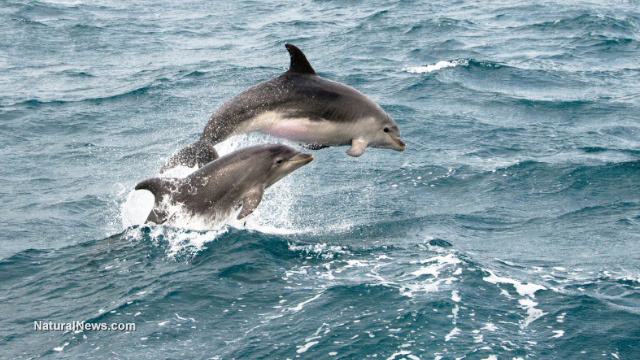 The two Franciscana dolphins, also known as La Plata dolphins, were spotted off the shores of a beach in Santa Teresita, a coastal town located a few hundred miles south of Buenos Aires. Beach goers apparently spotted the two playful cetaceans, which are widely considered to be an endangered species due to their dwindling numbers, and decided to pluck them out of the water so they could take selfie photos for their social media accounts. After the ravenous mob got done passing the two sea mammals around as a public spectacle, one of the dolphins was discarded on the sand and left to die. Reports indicate that the poor creature was still gasping for breath as the horde of mindless zombies fled the scene and moved on to other presumably selfish endeavors, not the least of which probably included applying filters to their selfies and uploading them to Facebook and Instagram. "At least one of these dolphins suffered a horrific, traumatic and utterly unnecessary death, for the sake of a few photographs," reported a spokesman from the World Animal Protection group to ABC in Australia. "This terribly unfortunate event is an example of the casual cruelty people can inflict when they use animals for entertainment purposes." What makes this gruesome incident even more disturbing is the fact that only about 30,000 La Plata dolphins remain in existence. Though they have a somewhat lengthy lifespan of about 20 years on average, they're a particularly vulnerable species of dolphin that, unlike their various dolphin cousins, can live in both freshwater and saltwater. Full-size La Plata dolphins typically measure between three and five feet in length, and their noses are markedly longer than those of the dolphins most of us are used to seeing at aquariums and in movies. They're beautiful creatures that, like other dolphin species, are exceptionally smart – National Geographic published an amazing piece last May that likened dolphins to humans in terms of intelligence and communication ability. But this didn't stop a mob in China from doing the same thing to another injured dolphin – in this case not a La Plata – that washed up off its coast. A group of men reportedly gathered around the unfortunate animal, not to help it, but to snap photos alongside it for bragging rights. And again in New York, a small shark reportedly died after a mob swarmed it for photo purposes, only to leave it for dead on the coastal sands of the Empire State. As for the La Plata dolphin species, an Argentinian wildlife group known as Vida Silvestre issued a statement recently, urging the public to look out for these precious creatures and avoid harming them. "It is vital that people help to rescue these animals, because every Franciscan counts," the group stated. The International Union for Conservation of Nature added the La Plata dolphin to its Red List of Threatened Species, after hundreds of them were captured in fishermen's gill nets annually during the 1960s, according to the National Oceanic and Atmospheric Administration (NOAA).